Derin has had a great start to the two first weeks at the Sunshine Tour in Vejer de la Frontera, Spain, with three wins during the second week of competition. Dadjak Ter Puttenen kicked off the tour last weekend with a fourth place in Friday’s CSI2* 1.45m Longines Ranking class, and continued his top form into week two. On Saturday, Dadjak went off with the win in the CSI3* 1.45m Small Grand Prix counting for the Longines Ranking with a double clear round and a lightning fast jump-off. On Sunday, Dadjak was in winning mood again and took the victory in the CSI3* 1.45m Longines Ranking speed class. On Tuesday, Flaming Key SR Z did a great performance and won the 7-year-old competition beating a field of nearly 100 horse-and-rider combinations. 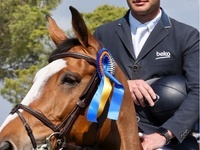 Derin’s newest addition Hunter did his first international 6-year-old classes delivering three clear rounds in a row, while Je Suis van de Bien also jumped two out of three rounds clear this week. The Sunshine Tour continues next week with CSI4* competitions.